The first item I was sent by Everything 5 Pounds is this gorgeous cream knitted jumper, perfect for the colder months! The one thing which attracted me to this jumper is the pattern! I am a knitter myself and I do have my favourite stitches when it come to scarves, jumpers etc and I definitely fell in love with this one! It's very me! I found this jumper was fairly short in the body for me, however I am tall so this is completely expected but I still love it! I paired it with a pair of blue skinny jeans and it will be one of my go to outfits, especially for University. Not only is the pattern absolutely stunning, but the jumper is high quality and is quite thick, but not too chunky! It definitely kept me warm when we were taking these shots and it was the coldest day that we've had so far! You can find the Ribbed Cable Knit Jumper here in various colours! I also found this Pink Boyfriend Coat and I instantly fell in love! 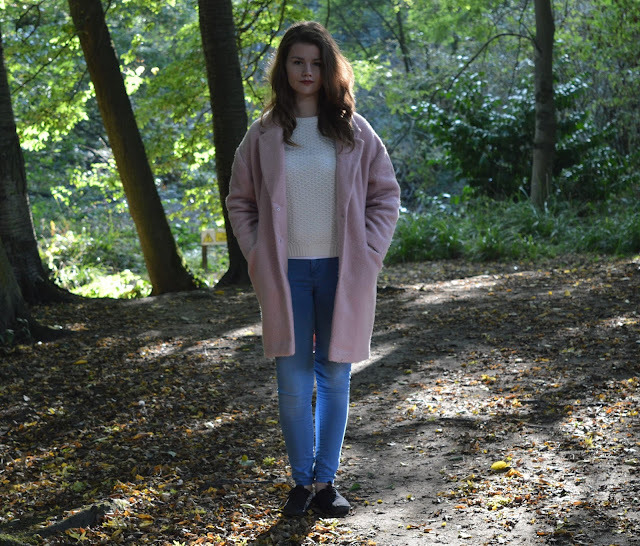 This coat is very me as it's big and baggy and very very cosy! Something everyone needs in their wardrobe in Autumn and Winter! One aspect I love about this coat is the massive pockets, and I mean massive! They could probably fit the contents of my handbag in and still have room and I love when coats have these pockets which you could fit a whole army in, they're brilliant when you have cold hands! I also love how big this coat is! I'm not entirely sure why they call it a Boyfriend Coat, I'm guessing because it's huge and quite square? I wouldn't usually go for a design like this with the broad shoulders and the boxyness to it but I love it for some reason with this one! I chose this in two sizes smaller than what I would usually pick and it still comes up fairly big on me, which is great for a confidence booster! The label in this coat is Atmosphere (Primark) which is probably why I love the quality of it so much! It amazes me though how thick and warm this coat is for only £5. This is what you call a bargain! 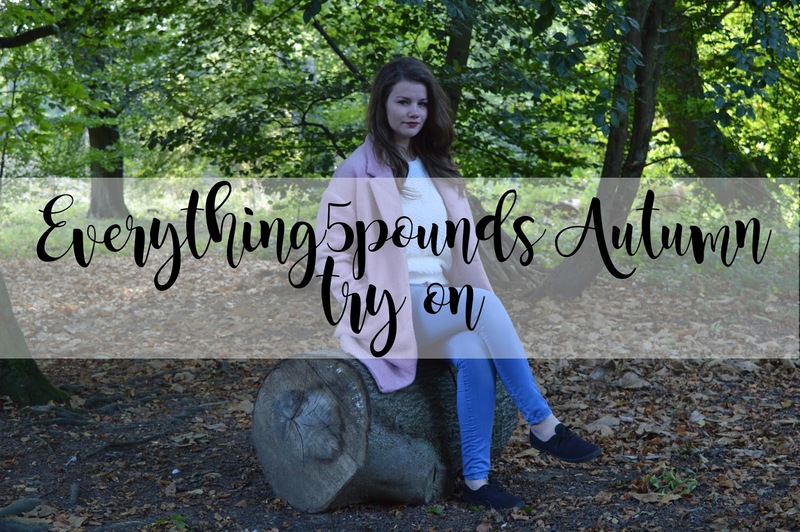 I really cannot see me getting cold when wearing this in Autumn and Winter which is an aspect I have been looking in coats when trying them out. Are they thick enough to keep me warm without having to layer underneath? Have you tried Everything 5 Pounds? What's your favourite item from there? I'd like to thank Everything 5 Pounds for kindly giving me the opportunity to review a couple of their products. This blog post features product/s which were sent to me for review purpose however all opinions are my own and completely honest. I had the opportunity to choose the items to try out and review and I chose the items which I would wear on a weekly basis and ones I knew I would love. Loved the post! I've got a few things from Everything5Pounds in the past but i haven't seen anything i've liked on there for ahwile, I didn't know until the other day that the products on there are from highstreet stores like Primark and H&M. I'm definetley going to have to have a look on the website again because i LOVE that coat!